Three major rhythmic gymnastics competitions will be organized in Baku this year: the World Cup, the European Championships and the World Championship, head coach of the Azerbaijani national rhythmic gymnastics team Mariana Vasileva told Trend on Mar. 2. She made the remarks after a draw of the 2019 European Championships in Rhythmic Gymnastics held March 2 in the National Gymnastics Arena in Baku. “It doesn’t matter under which number our gymnasts will perform. The most important thing is how the team will perform and which results it will show,” the head coach said. Mariana Vasileva pointed out that it is always more difficult to perform at competitions held in the homeland. "It is always more difficult to perform in the homeland. It's because you want to show the best performance. Of course, we want to achieve high results at all competitions where we participate, but at competitions in Azerbaijan you always want to raise the national flag and hear the anthem," she said. Speaking about the upcoming competitions in rhythmic gymnastics, Vasileva noted that each start is important. "For us, every competition is very important. This is preparation for our participation in the Olympics. We strongly believe that we will participate," the head coach of the team added. Speaking about the preparations for organizing the European Rhythmic Gymnastics Championships in Baku, Vasileva stressed that during two days, representatives of the European Gymnastics Union (UEG) held meetings with the local organizing committee of the Azerbaijan Gymnastics Federation and discussed issues related to preparing for the Championship. The head coach noted that the names of Azerbaijani gymnasts who will represent the country at the European Championships in Baku have not been determined yet. "Now we have seven candidates among seniors who will perform in the individual program. There are four gymnasts among them, who are more experienced ones. But I send all gymnasts to different starts, rotate them," she said. Also, the head coach noted that for the first time in the European Championships in Baku in the group exercises, juniors will perform with two programs. They will perform with five hoops and five ribbons. 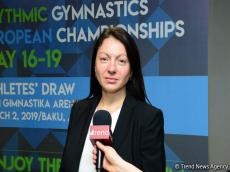 Speaking about the upcoming plans, Mariana Vasileva said that at the end of March, Azerbaijani gymnasts will take part in the Grand Prix in France. "On March 8, we leave for the matches in Italy. In Italy, similar matches are held annually before the season begins, and we are invited to them for the first time," the head coach noted.